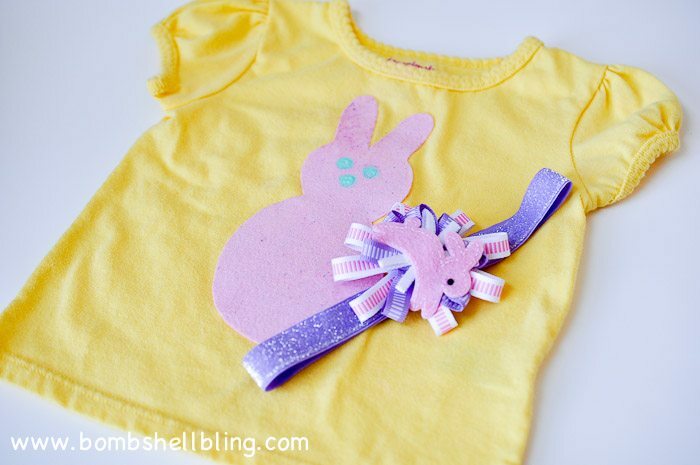 Easter Bunny Outfit: A Sweet & Simple Idea for your Little Girl! 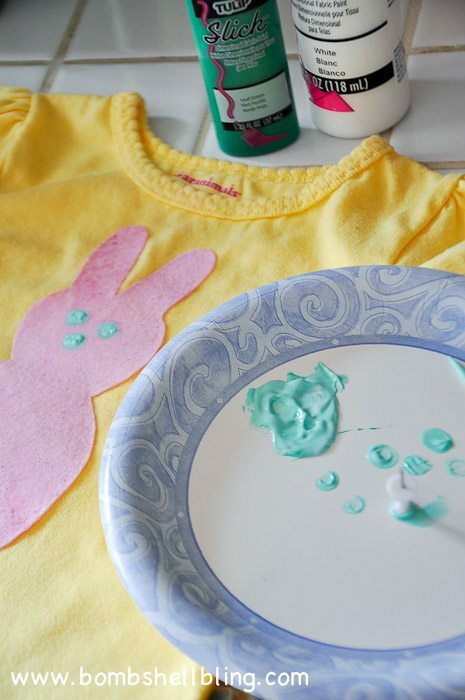 Make your little girl a sweet Easter Bunny outfit with this simple tutorial. Perfect for any age – baby to child! SO CUTE! Spring has finally sprung! 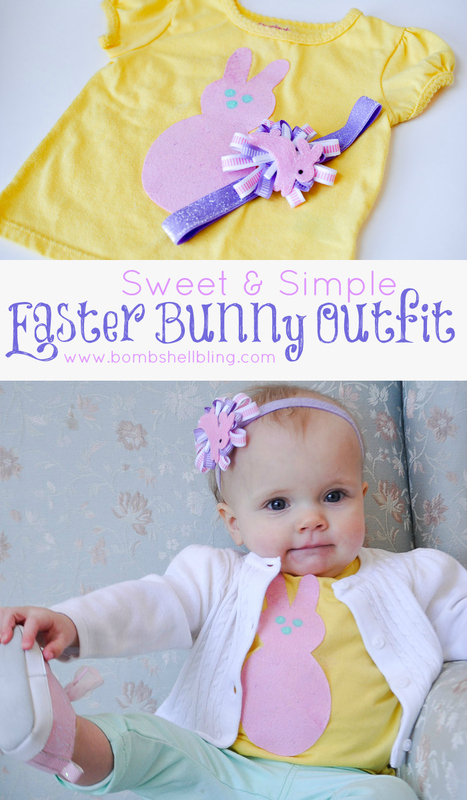 I am so excited to share a little more Easter inspiration with you today with this Easter Bunny outfit! I made it last year for my daughter, and then I forgot about it. When I was going through my picture folders I came across it and decided to share it with you. As a side note, I can’t BELIEVE how much she has grown up in the last year. Slow down, baby! Waaaaaahhh!!! Let’s start with the shirt. I grabbed a basic tee from Walmart, a sheet of pink felt, Heat n Bond, fabric paint, and a pencil. Start by ironing Heat n Bond onto some pink felt. Then draw a large Peeps-eque rabbit onto the Heat n Bond paper. I free-handed mine, but you could do a Google images search for “Peeps rabbit” and find something to trace I’m sure! Then cut out your rabbit form. Next peel back the paper from the Heat n Bond. Usually you can just stick the form onto the fabric at this point (Heat n Bond side DOWN! 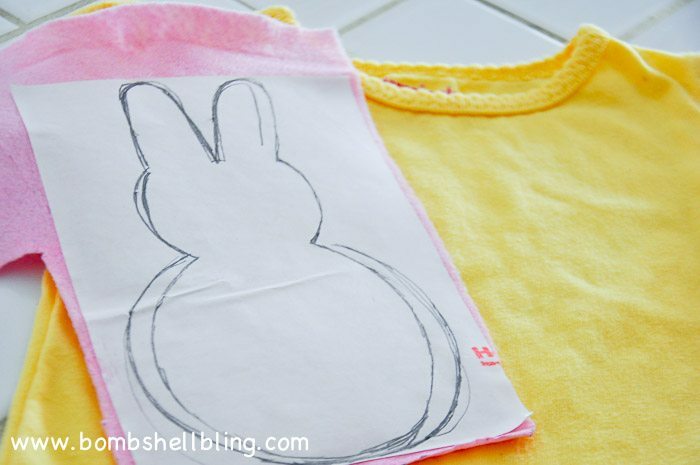 ), but with thick materials like felt I like to use the iron to heat up the t-shirt first and THEN place the bunny form (HEAT N BOND SIDE DOWN) into place on the shirt. It just helps it adhere more easily. 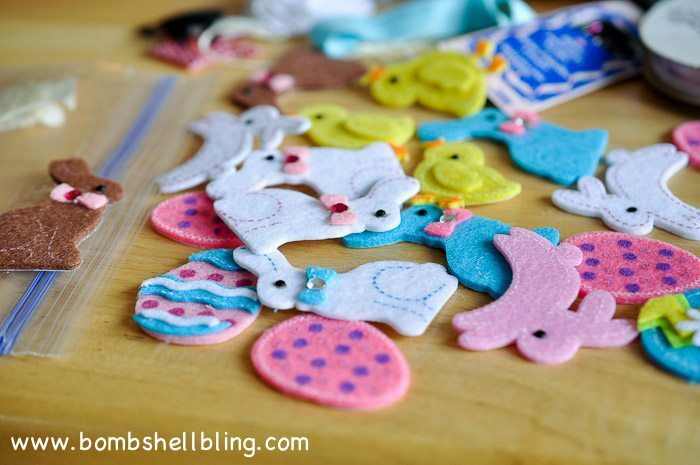 Time to add eyes to your Easter Bunny! I mixed two colors of fabric paint to make a pretty pastel color, dipped a pencil eraser into the paint, and dotted on some eyes. Super simple, huh? 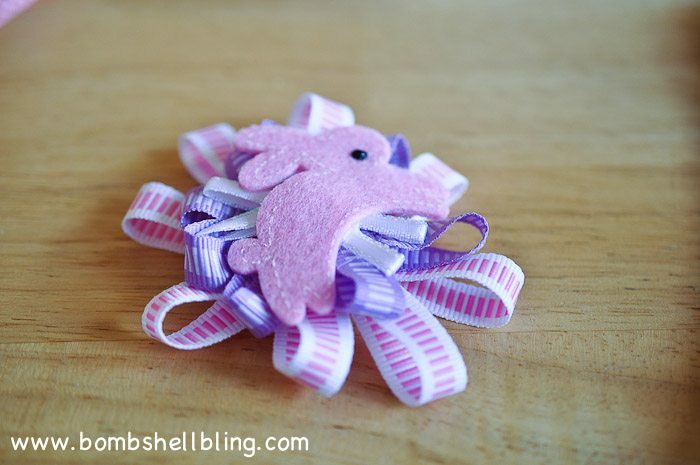 Now it’s time to make the Easter Bunny inspired headband! 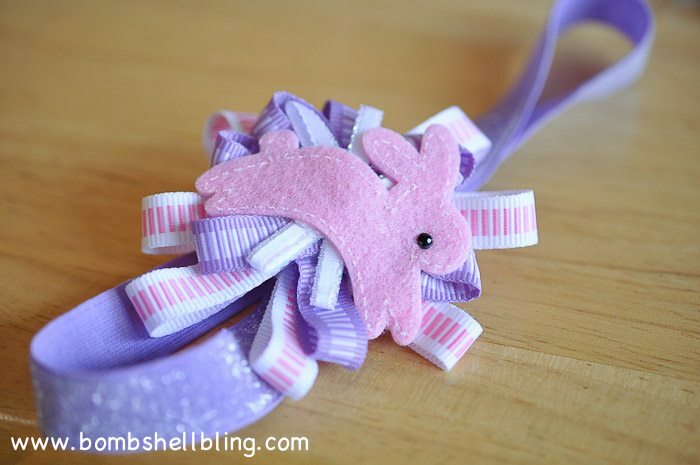 For this headband you will need some ribbon, a felt Easter Bunny sticker, some fold-over-elastic, a clip and a bit of felt, and a hot glue gun. I love felt stickers. They are my crafting secret weapon. They are cheap, easy to find at craft stores, and they look fancy. I use them for hair bows, frame embellishments, etc. I love them. I believe I got this package of felt stickers at JoAnn Fabric and Craft Stores. 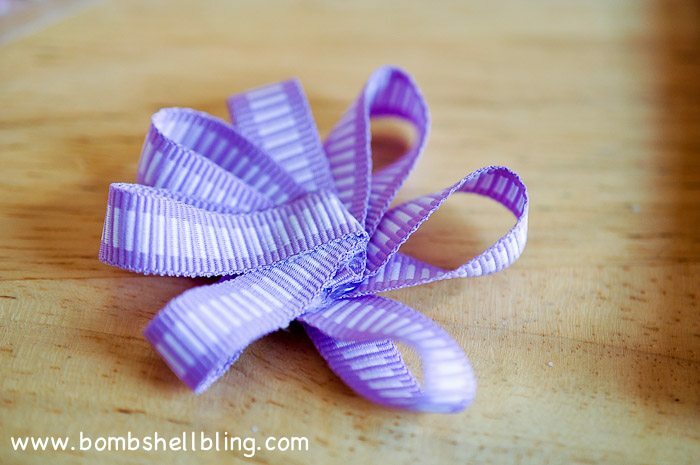 Use your hot glue gun to fold, loop, and glue ribbons into a flower fanned shape. Mine here ended up being two parts glued together. Repeat until you have three different “flowers” of varying size. 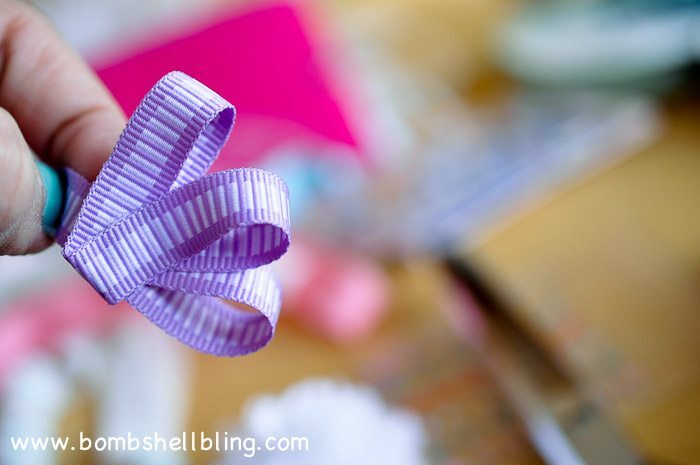 Use your hot glue to stack the ribbon flowers on top of one another, and then glue the sticker into the center. 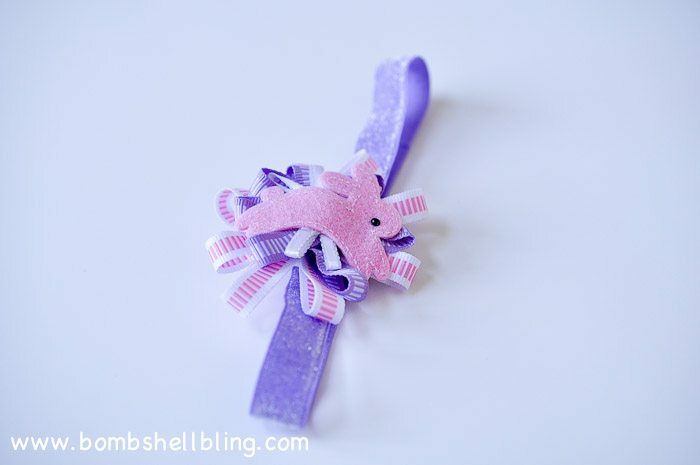 Next you will attach your creation either directly to a fold-over-elastic headband or to a clip, which can be clipped to a headband now and into hair later. That’s what I chose to do so it would work for years to come. 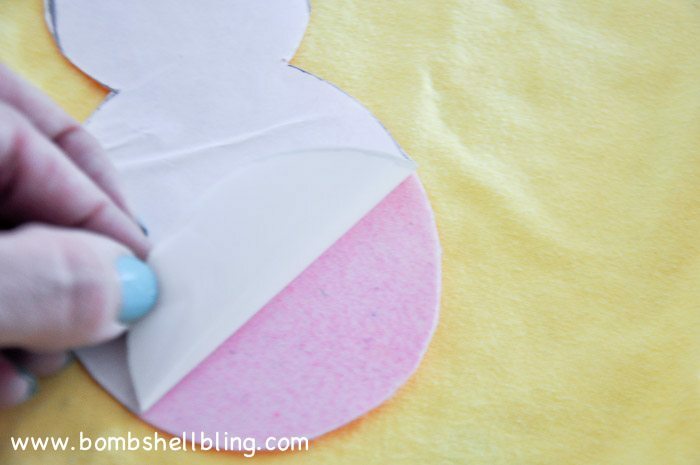 Start by gluing a small circle of felt to the back of your creation. 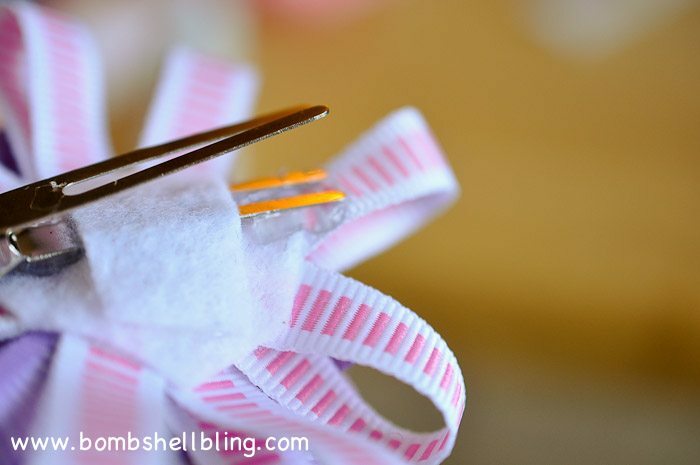 Next glue the clip (or headband elastic if you are not doing a clip) onto the felt, and then add a small square of felt OVER that, as shown below. 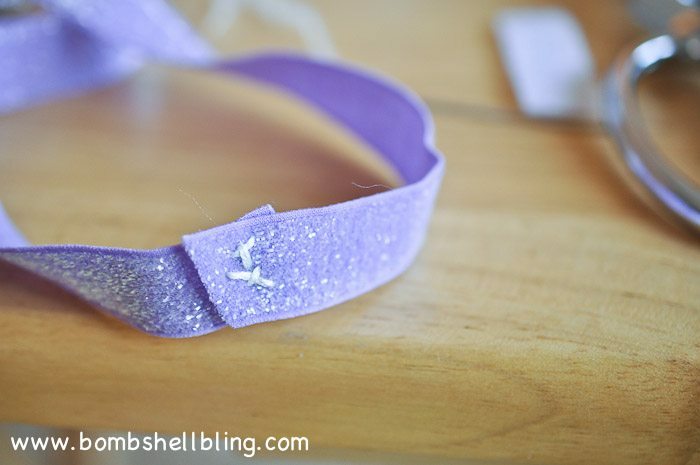 I like to do this to “seal in” my clips/headbands and make the hair accessory more secure. You can prep your elastic by measuring your baby’s head. Cut the elastic 1-2 inches shorter than that measurement, depending on how stretchy the elastic is (the stretchier the elastic the shorter you can cut the elastic). Now hot glue (seriously!) or sew the ends together. 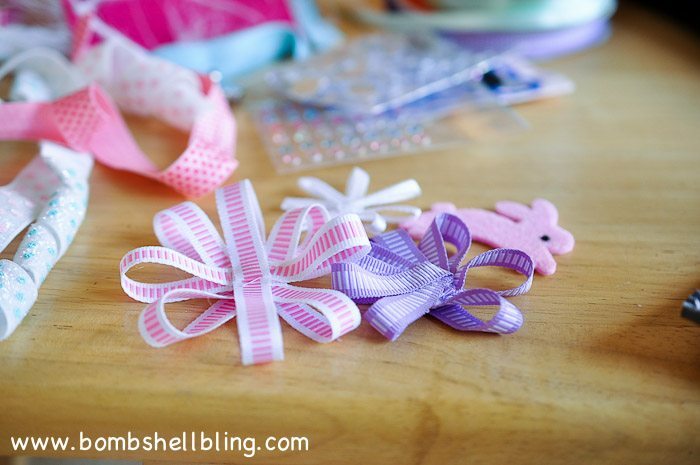 Clip your masterpiece onto your elastic and you are finished! All done! 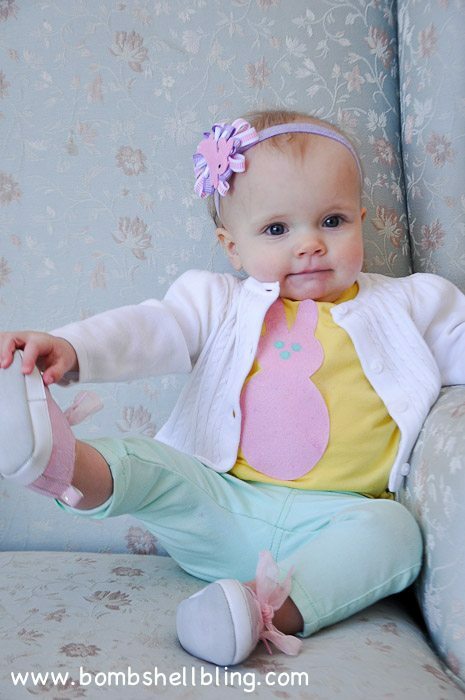 Go dress your little princess in her brand new Easter Bunny outfit! Happy Easter! She’s precious!! Love the whole outfit you made for her. She looks adorable!! Um… Could Jade be ANY cuter in the second to last picture?? I die! 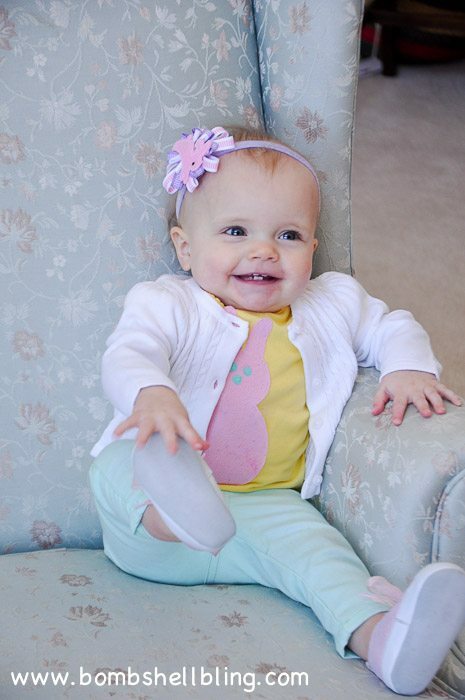 Sarah…..this Easter outfit is so SO cute! You are awesome lady! She is adorable! And so is the outfit!